I am Glenn Campbell. I travel continuously and create videos every few days wherever I happen to be, mostly uploaded to YouTube. However, many of my YouTube videos are "unlisted", so I have created this page to index most of them. UPDATE Aug. 2012: I have given up on maintaining this page! It was too much work. I have retained this page for whatever useful information if may contain, but the list below includes only about half of my public videos. For more, go directly to my My YouTube page and browse the lists there. Also see my photo page, where some of my videos are listed geographically. My videos, listed below, fall into these general categories: Character Videos, Edited Travel Videos, Video Postcards, Philosophy Videos, Songs, Experiments and Miscellaneous. You'll also find an Overview and History of my video career. See my Photo Index for videos indexed by location. Items below in bold print are my own favorites. Travel and parody videos in which I am speaking in a persona other than my own. 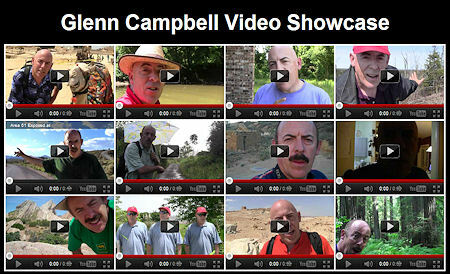 Most are shown in Glenn's Video Showcase. 5/27/10 - Phoenix, Arizona: The Tragic Effects of CNN on the Brain (1:29) - The poor guy has overdosed! 5/24/10 - San Fidel, New Mexico: Message from a Tribal Elder (1:46) - Please gamble responsibly! 8/2008 - Area 51, Nevada: UFO Hunters: Area 51 Revealed (8:29) - pretending to be an Area 51 expert. 5/8/11 - Gurney, Ontario: Exploring Harry's Hideaway (5:42) A remote roadhouse. 6/10 - Sarajevo, Bosnia: Sarajevo Sniper Alley (0:27) My most popular video on YouTube. 5/26/11 - Amarillo, Texas: Cattle Call (2:07) Texas feed lot. 4/21/11 - Eilat, Isreal: Crowded Beach in Eilat (1:13) The most densely packed beach I have ever visited. 2/27/11 - Washington, D.C.: Landing in Washington (1:13) Impressive view of Capitol and National Mall. 10/2010 - Barstow, California: Flight for Life (0:19) My first iPhone video! 2/28/11: Abilene, Texas: What I Learned from Celebrity Impersonators - We are all impersonators! 2/24/11 - Las Vegas, Nevada: Linguistic investigation of "Double Entendre" - From Fremont Street. 2/11/11 - Istanbul, Turkey: Too Much String Cheese! 1/22/11 - Washington, DC: Political Hot Air - from the steps of the Capitol! 12/21/10 - Utah: The Problem with Love - The risk of love is losing control over your own destiny. 12/18/10 - Georgia? : Universal Health Care: A Southern Perspective - Funny and meaningful. 12/16/10 - Cambridge, Mass. : Goals and How to Achieve Them - from Chicago's Millennium Park. 12/15/10 - Cambridge, Mass. : "Quality and Deception - From the Harvard Museum of Natural History, with free museum tour! 12/11/10 - Concord, Mass. : In the Footsteps of Thoreau at Walden Pond - From Thoreau's cabin site. 12/8/10 - Ithaca, NY: What is Truth? - Truth is pretty simple really. 11/25/10 - Practice Makes Perfect... Idiocy! - Why rote practice is usually not the best use of your time. 11/23/10 - Bear Flats, Yukon: Human Feedback Systems (11:37) Includes free tour of abandoned Yukon roadhouse! 11/7/10 - Miami Beach: The Law of Diminishing Returns (7:46) My first (deliberate) philosophy video. 5/30/11 - Athens, Greece: My First Mission in Athens (0:17) Sinister voice experiment. 5/27/11 - Joplin, Missouri: Tornado Chasing in Oklahoma (0:13) Editing experiment. 5/13/11 - Gary, Indiana: Spooky Cathedral (0:11) Experimental pan and fade. 3/12/11 - Cincinnati, Ohio: My Ikea Adventure (3:50) An editing exercise, shot with my iPhone. General information on my video making. To see nearly ALL of my videos, including the unlisted ones, see My Twitter Announcements of new videos as they are published. Some of my earliest videos are stored on Facebook (about 45 of them), but I no longer use Facebook for new videos. For a while, I uploaded some cellphone videos to TwitVid (13 videos). I intended this feed for unedited, spur-of-the-moment videos shot with my iPhone. However, I eventually decided to upload these to YouTube instead (usually unlisted, but visible above and on my Twitter Index). Also see this: Twitter index of TwitVid iPhone videos as they were published. I took a few travel videos in a pre-internet era, but nothing memorable. I resumed video in May 2010. My first-ever uploaded video was "Rooster Eats my Ice Cream" on May 6, 2010. My first upload to YouTube was The L.L. Bean Boot on May 23, 2010. I tried several video cameras in 2010, but finally settled on the Canon Vixia HF M300. (It was stolen once, and I bought the same model again, which indicates my happiness with it.) This camera does full 1024p hi-def, but I usually edit and upload in 720p. I also take spontaneous travel videos with my iPhone 4. I edit videos using Cyberlink Power Director, which does just about everything I want. However, I stabilize shaky videos using the YouTube Editor, which does a better job than Cyberlink.